Ms. Lange has been the senior adviser for The Paper Cut since its inception in 2015. She began her career at Sahuaro High School in 2003 and currently teaches senior English and the class she loves to end her day with - The Paper Cut. She has insatiable wanderlust - 34 countries so far with plans to take students to Italy and Greece with a 3-day island cruise in June 2019 (contact her in room 207 if you want in!). She believes she is living a charmed - she feels blessed to have been able to savor sushi in Japan, walk where Elie Wiesel & Anne Frank have walked, zip line over the rainforest canopy in Costa Rica, and dip her feet in the beaches of Normandy. 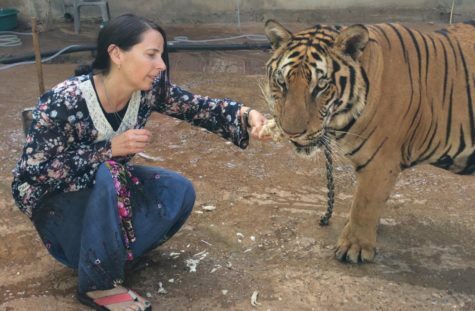 She has rough-housed with a room full of baby tigers, pet a koala in Australia, had a giant sea lion try to attack her in the Galapagos, and swam across a river on an elephant in Thailand. This Fall she will check off one more on her bucket list when she goes on safari in Africa.